Setting government-mandated minimum wage law is wrong because it only protects those who have jobs already while discouraging the hiring of the jobless who have less skill, or have little or no job experience yet. That regulation is supposed to protect workers from "capitalist exploitation", thus, even the unskilled or the young and unexperienced should be given the minimum wage by their employers. When faced with a higher labor cost, plus other labor regulations that make it difficult for employers to fire even lazy workers, the tendency of employers is to hire as few workers as possible, then let those who are hired to work as fast and as productive as possible. The Economist released a good chart the other day, "Youth Unemployment: the outsiders" in its July 5th 2011 issue, Daily Chart. OF THE many gloomy indicators generated by the financial crisis in the rich world, the sharp rise in youth unemployment is perhaps the most dispiriting. Countries that entered the crisis with this problem already entrenched, such as Spain, have fared the worst. Their labour markets tend to be characterised by privileged cliques of workers with high levels of job protection, and indignados who are outside the system, banging on the window in the hope of being let in. It should be a terrible condition for many young, fresh graduates in universities (or university drop outs) in Spain, Croatia and Greece, to find a job. I concur with the description by the magazine above about youth unemployment. I developed this graph today to help explain the phenomenon. If there is no government-imposed minimum wage law, then even the most unskilled, those with zero job experience, can easily find a job as there will be takers for them at a lower pay. There is a market for everyone, both job-seekers and job creators. 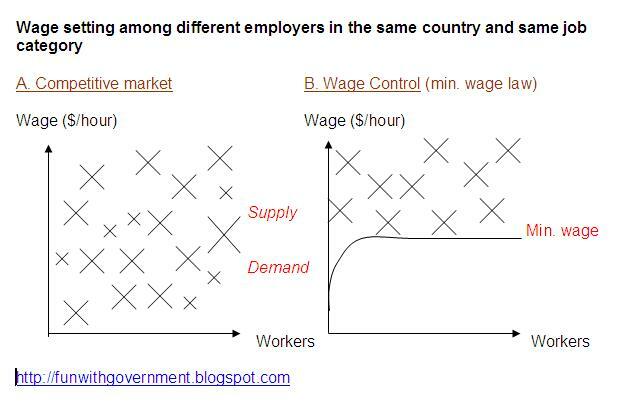 The result is a wide range of wages (the "equilibirum point" or intersection between supply and demand) among different workers and employers, for the same job category, say house construction workers or bus drivers, etc. Enter the nanny state and imposes a minimum wage law, whether at the national or regional/provincial level. A minimum wage is the "floor wage" that even the most unskilled job seeker should be entitled to receive. The tendency of employers then is not to hire the unskilled, the little or zero experience young job applicants. There are also additional costs in training them before assigning them in actual work. What results is a hollow space below the minimum wage curve or line. It represents the level of unemployment in the economy. So the higher the mandatory or minimum wage, plus other rigid labor regulations, the higher will be the unemployment rate. The implication is simple: governments should abolish their minimum wage laws and regulations. Allow the employers and potential employees to craft their own employment contracts. 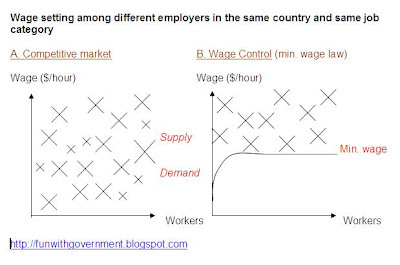 Employment is a private contract between the two, and government has little role in such contract. Only when one party will breach their private contract (the employer does not give the stipulated salary rate, other benefits; or the employee is lazy and insist that he should be entitled to so many separation benefits before he should be fired; many other cases) will government comes in. To enforce the rule of law, the law or contract between the employer and employee/s.